This morning I opened a new CD which arrived in the post, which I’d – in a small way – helped crowd fund. 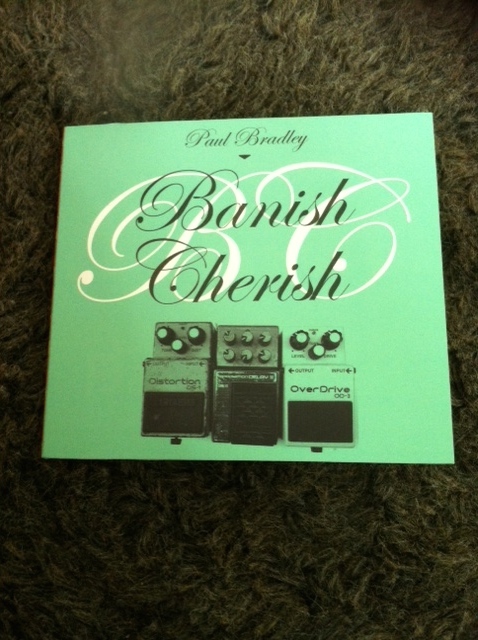 ‘Banish Cherish’ by Paul Bradley. Sitting on the sofa, I let myself be transported into vocal beauty, fearless passion and poetry, and a wild state of artistic vulnerability. It’s filmic and theatrical, local and cosmic and has moments of humour. There is no single genre. A few years ago, I was lucky to write for and direct Paul in ‘The Owl’, a theatrical performance for children, and get to know his lovely family. Paul had asked me to write a story to wind it’s way around the nursery rhymes and songs which feature in his children’s album ‘Calico Pie’. He performed – as always – with talent, freshness and humanity. It was a Bristol Old Vic collaboration: Paul had been given a slot with Bristol Old Vic’s Ferment festival, and afterwards it had a staging at St George’s Brandon Hill and around some festivals. Somehow I managed to organise a trip with ‘Me’, for a recording session, to a haunted, deeply rural, North Welsh house by the sea for a whole week. The house belonged to my Dad’s family at the time, and we’d spent lots of summers there as a family. Walking over the fields to the beach laughing and joking with an indie band was a different kind of Welsh adventure. This weekend, I will close my eyes and listen to ‘Banish Cherish’ again, and then probably again. And perhaps think about how I will get to work some more with this man.